Hi all! How's your summer going? Mine has been BUSY with a capital "B"! Swimming lessons, playing at the pool, ballet classes, play dates with friends, birthday parties to go to, birthday parties to plan... I have been so busy with my kiddos, I've hardly had time to sit still for 5 minutes, let alone stamp up some goodies to share. I did manage to put this card together for a recent shoebox swap using stamp sets from the new catalog. This adorable set is called Apple Blossoms and it is a Level 2 hostess set. I used Fall to Layout #95 from the Clean & Simple blog. 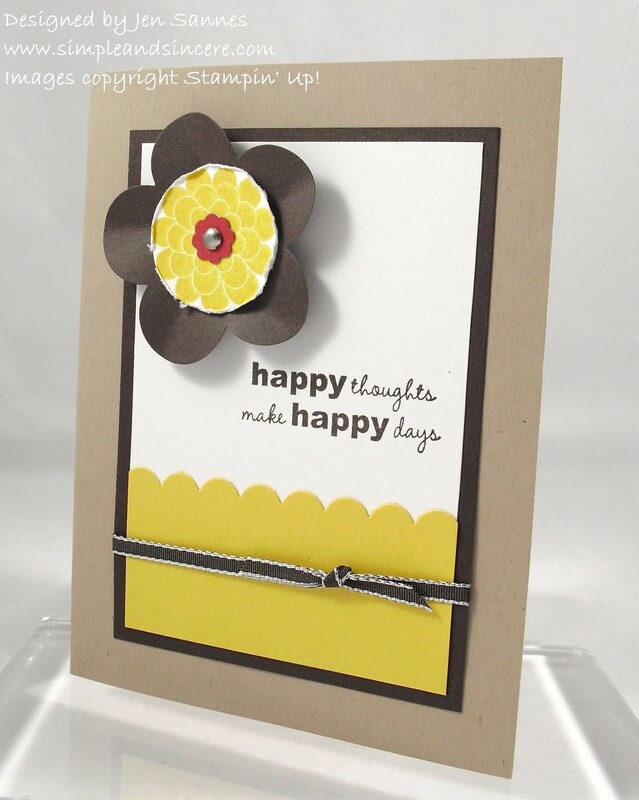 I added a little extra dimension to my flower by rolling the petals around my finger - it really pops off the card. And don't you love that little touch of Riding Hood Red? So bright and cheery! Lots of sneak peeks on this baby - I used Early Espresso cardstock and ink, Daffodil Delight cardstock, the Apple Blossoms stamp set and some of the new narrow taffeta ribbon in Early Espresso. I can't wait for the July 1st when I can begin ordering some of the new goodies in the catalog - wahoo! Hope you've enjoyed today's card - I'll be back soon to share some pictures from Heidi Fest. 'Bye for now!